Under the approval of the State Council, Wuxi New District Integrated Free Trade Zone, founded in April 2012, was transformed and upgraded from Wuxi Export Processing Zone. The newly-formed free trade zone covers an area of 3.497 square kilometers, of which 2.385 square kilometer-area (the first phase of its development) was approved and accepted by ten national ministries and committees including athe General Administration of Customs. 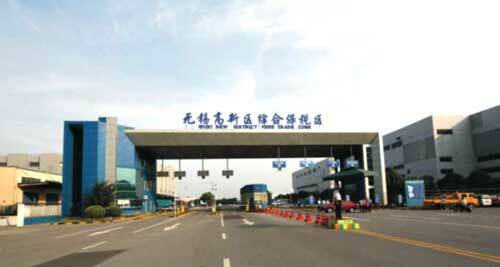 Currently, the fully-featured free trade zone is a special open area enjoying high level of openness and optimal policies with its Customs-approved businesses ranging from bonded processing, bonded logistics, bonded trade, R&D, inspection and maintenance, international procurement, distribution and delivery, product exhibition to port work etc. For enterprises located in this zone, their imported goods can be registered and enjoy relevant bonded treatments in this zone while the exported ones will be treated as the imported without being imposed valued added tax (VAT). The exemption of VAT and consumption tax also applies to the products manufactured and sold in this zone or planned to export abroad. With more than 40 approved projects and a combined foreign investment of $7.6 billion, the free trade zone has established many industrial groups characterized by large-scale integrated circuit, high-end electronics, precision machinery, modern service and so on, helping the zone to be ranked the top in terms of comprehensive strength among the special areas under national customs surveillance and the first in China in terms of total investment, land coverage, investment density, added value and comprehensive tax revenue. In the future, based on the advanced manufacturing industry, the free trade zone will give a full play of its advantages in policy functions and move ahead to build inself into China’s first-class integrated free trade zone. It will become a comprehensive bonded area featured by a top-class distribution center, a trade exhibition center and a maintenance center.